The More coat of arms was placed above the entrance at the time of the addition of St. Thomas More as co-Patron of the church following his canonisation in 1935. More loved puns on his name, as evidenced by the Moor’s head and the moorhens. These two stained glass windows were executed at the same time as the West Window. The one north of the door is of St. Thomas More and was a gift of the Moore family; the one south of the door is of St. Francis of Assisi, a gift of the then parish priest, Father Patrick Nolan. The stained glass representation of the Risen Lord was a gift of Lady Hogan in 1991 in memory of her late husband, Sir Michael Hogan. 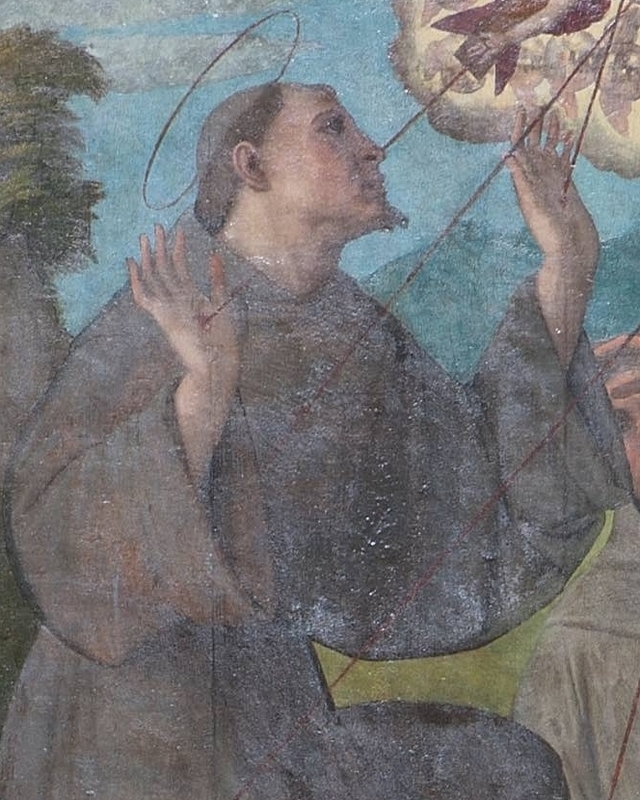 This painting, attributed to the school of Correggio, depicts St. Francis receiving the stigmata, an event that took place during a vision on Mount Alverna in 1224. Francis, the son of a wealthy merchant, was inspired by his love of the poor to renounce his inheritance, famously divesting himself even of his clothes in front of his father and the Bishop of Assisi. Founder of the Franciscan Order, he is also known for his inauguration of the Christmas crib at Grecchio, and his composition of the Canticle of the Sun. He was canonised in 1228 by Pope Gregory IX. His feast day is October 4th. 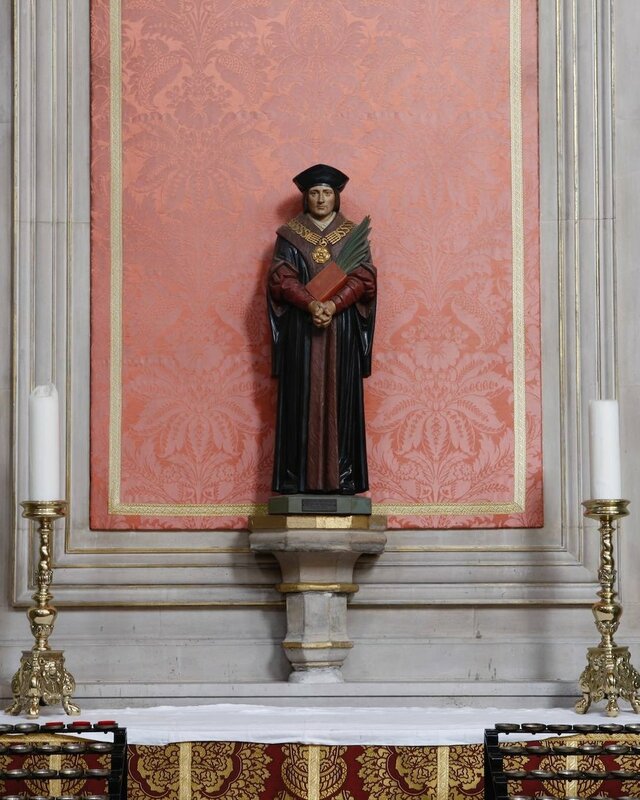 This altar was commissioned by the then parish priest, Father Philip Valentin, to commemorate St. Thomas More’s canonisation, with St. John Fisher, by Pope Pius XI in 1935, 400 years after their martyrdom. A reliquary containing a first class relic of St. Thomas, acquired from the Belgian convent entered by More’s step-daughter, Alice Alington, used to stand on this altar, but it was stolen in the 1960s. The feast day of St. John Fisher and St. Thomas More is June 22nd. Pope John Paul II declared St. Thomas More the patron saint of statesmen and politicians on October 31st, 2000. This is another of the statues given in memory of Diana Mary Lewis. Devotion to the Sacred Heart of Jesus is understood both as devotion to the physical heart pierced by the soldier’s lance (Jn 19:34) and to the heart, “pierced by our sins and for our salvation” (CCC 478), as symbol of Jesus’s self-giving love for all humanity. The Solemnity of the Sacred Heart is celebrated on the Friday following the second Sunday after Pentecost. St. Therese, a Carmelite nun, was beatified in 1923 and canonised in 1925. She was declared Patron of the Missions in1927, Patron of France in 1947 and a Doctor of the Church by Pope John Paul II in 1997. Devotion to her spread, primarily through the publication of her spiritual autobiography, The Story of a Soul, and her “Little Way” to holiness, to which anyone could aspire. She promised to ‘spend her heaven doing good on earth’ and to ‘let fall a shower of rose petals from heaven’. Her feast day is October 1st. This statue is one of three given in memory of Diana Mary Lewis. It depicts St. Antony of Padua, a Franciscan friar and notable preacher. After a period as Provincial of the Order, Antony retired to Padua, to a life devoted to preaching. Revered since the 17th century as the finder of lost things, there is a legend associated with his preaching to the fishes. He is also known for his devotion to the poor. Canonised in1232 by Pope Gregory IX, he was declared a Doctor of the Church by Pope Pius XII in 1946, and his feast day is June 13th. One of the most familiar subjects in Christian art is the body of the crucified Christ laid in the arms of his mother, Mary, the most famous example of which is that by Michelangelo, in St. Peter’s Basilica. This portrait of St. Francis, by an unknown artist, depicts Francis holding a skull. St. Francis has often been portrayed contemplating a skull, which is believed to be a reference to the crucifixion, which took place a Golgotha, the place of the skull. The mark of the stigmata can also be seen on his left foot. Apostle to the Gentiles, St. Paul was famously converted from a persecutor of the early Church to the most zealous preacher of the Gospel. He embarked on missionary journeys from Antioch, founding Christian communities as far west as Corinth and Athens. His letters of admonition and encouragement, written to the churches he founded, as well as to the community at Rome, which he had not founded, form the principal part of the New Testament, apart from the Gospels. He is depicted holding a sword, the instrument of his execution in the persecution of Nero. His burial place, under the present position of the high altar of the Basilica of St. Paul Without the Walls, has been recently confirmed. 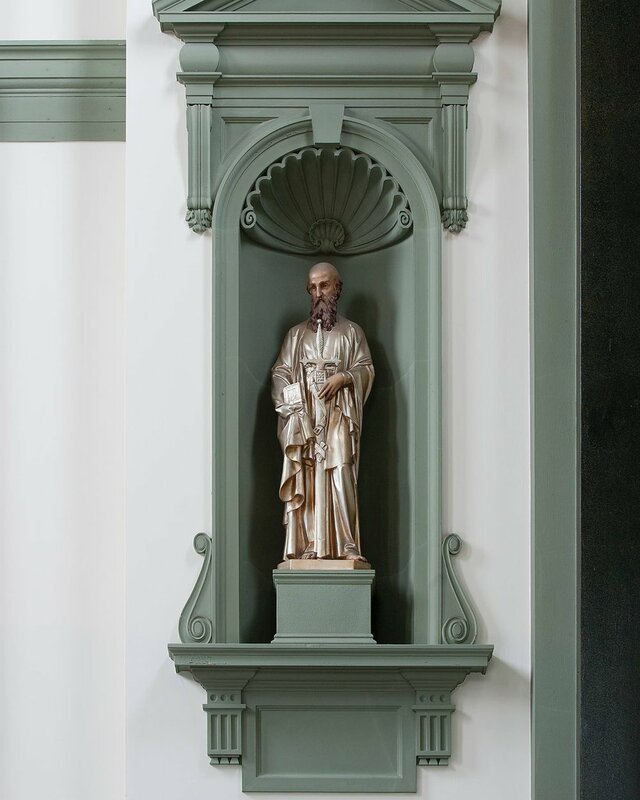 These two statues, believed to be French in origin (the statue of St. Peter is inscribed “Pierre”), were most likely a gift from the Mother church, St. Mary’s Cadogan Street, which was a French foundation. The Solemnity of Sts. 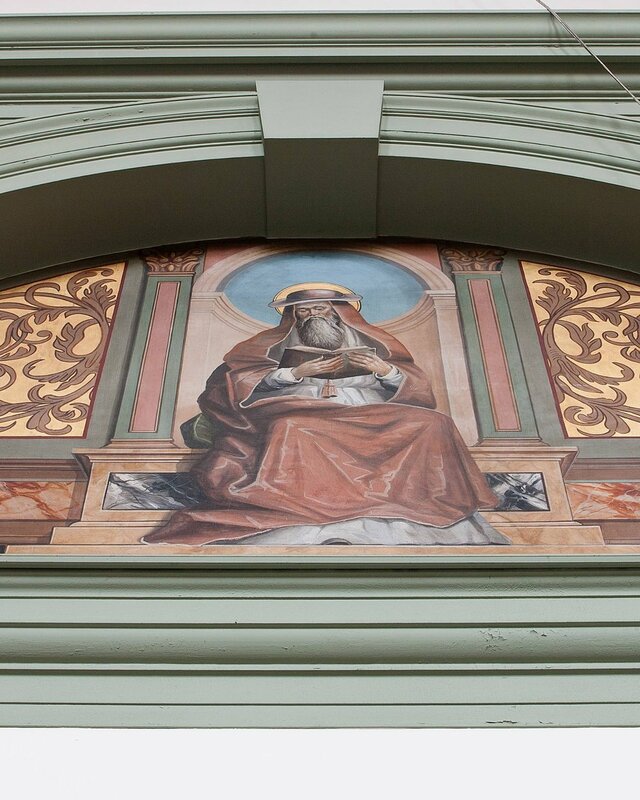 Peter and Paul is celebrated on June 29th and is a Holy Day of Obligation. Prince of the Apostles and first Bishop of Rome, St. Peter first recognised Jesus as “the Christ, the son of the living God” (Mt.16:16). He is depicted holding the keys of the Kingdom of Heaven, which the Lord promised to give him (Mt. 16:19). He was executed in the persecution of Nero, according to tradition by being crucified upside down, and buried on the Vatican Hill, under the present site of the Basilica dedicated to his memory. This painting is believed to have been a gift to the church, but there is no record of the donor, and both the artist and the subject are unknown. Any information gratefully received. Born in Thagaste, in Roman North Africa in 354, the story of St. Augustine’s life is that of a ceaseless search for truth. Initially turning his back on his mother’s Christianity, he led a turbulent personal life before being re-converted and baptised by St. Ambrose in 387. He was reluctantly ordained priest in 391 and bishop in 396. His extensive doctrinal writings, letters and sermons (totalling more than five million words) have had a profound influence on the great theologians of subsequent centuries. He died in 430 and his feast day is August 28th. Born in Rome, the son of a Senator, St. Gregory gave up a political career, having been Prefect of Rome, for the monastic life. He became abbot in 585, was appointed one of the seven deacons of Rome and papal legate to Constantinople. He succeeded to the papacy in 590. He promoted sacred music, giving his name to “Gregorian chant”, and sent monks from his old monastery, led by St. Augustine of Canterbury, to evangelise the Angles of Britain. He died in 604 and his feast is celebrated on September 3rd, the date of his election as pope. St. Ildephonsus, Archbishop of Toledo from 657-667, had a vision of Our Lady presenting him with a chasuble, and this painting, by an unknown artist, depicts that scene. The painting is thought to be a gift of the de Zulueta family. Painted by an unknown artist, this lunette depicts Christ praying in the Garden of Gethsemane, with his disciples asleep nearby and the angels ministering to him (Lk 22:43). Born in 339 or 340, the son of the Roman prefect of Gaul, Ambrose initially pursued a career in law. Appointed by the emperor to conduct the election of the Bishop of Milan, he was instead persuaded by popular acclaim to accept the appointment himself. Because he was only a catechumen at that time, he received baptism and ordination to the diaconate, presbyterate and episcopate all within the space of a week in 374. He baptised Augustine on Holy Saturday, 387, and died on Holy Saturday, 4th April 397. His feast day is December 7th, the anniversary of his ordination as a bishop. 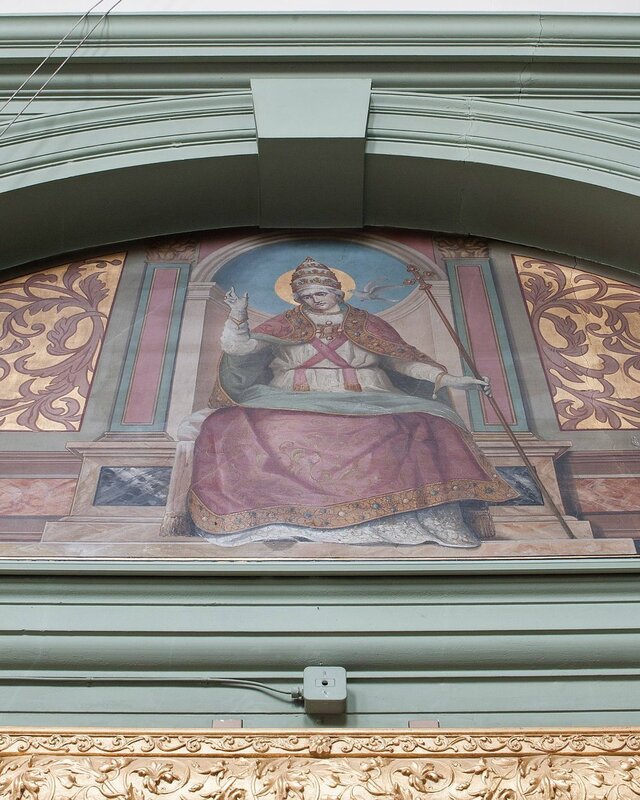 This mural, painted by the brother of Canon Keens (the “church builder”), originally covered the whole of the central portion of the East wall, but was reduced in size and enclosed in its “frame” during the time of Canon de Zulueta as Rector. As is traditional, it depicts Our Lady, St. Mary Magdalene and St. John, the beloved disciple, at the foot of the cross. Born in the Roman territory of Dalmatia in about 340, St. Jerome studied in Rome and was baptised there. After a period as a hermit in Syria, during which he learnt Hebrew, he returned to Rome, served as secretary to Pope Damasus and began his work of translating the Scriptures from the original Hebrew and Greek into Latin. Following the death of Pope Damasus, he travelled to Bethlehem and returned to the study of Scripture. “Ignorance of Scripture,” he wrote, “is ignorance of Christ.” He died at Bethleham in 420 and his feast day is September 30th. This painting, a gift of Canon de Zulueta’s mother, the Countess of Torre Dias, is a copy believed to be from the school of Murillo. The original hangs in the Galeria Corsini in Rome. This is a copy of the portrait by Holbein which hangs in the Frick Museum, New York. This maquette, entered by Enzo Plazzotta in the competition to choose a sculptor for the statue that now stands on Chelsea Embankment, near Chelsea Old Church, was presented to the church by the artist. This painting is another Murillo copy. The original hangs in the Museo del Prado in Madrid. Born at Avila in 1515, she entered the Carmelite order in 1535. During the course of a serious illness the following year, she developed the habit of mental prayer and underwent mystical experiences. She was responsible for reform of the Carmelite order, and her writings, particularly her distinctive contribution to mystical theology, led to her being named a Doctor of the Church by Pope Paul VI in 1970. She died in 1582 and her feast day is October 15th. This statue is believed to be Bavarian and to have been carved in the late 18th century. This Calvary scene was presented to the church by local artist Mr. Purnell. This, the third of the statues given in memory of Diana Mary Lewis, portrays Our Lord as a young boy, in the protective care of his foster father. The Solemnity of St. Joseph is celebrated on March 19th and the memorial of St. Joseph the Worker on May 1st.